Winner of the Anthony, Macavity, and Shamus Awards. A resident of one of LA's toughest neighborhoods uses his blistering intellect to solve the crimes the LAPD ignores. East Long Beach. The LAPD is barely keeping up with the neighborhood's high crime rate. Murders go unsolved, lost children unrecovered. But someone from the neighborhood has taken it upon himself to help solve the cases the police can't or won't touch. They call him IQ. WaPo: Joe Ide, one of this year’s more unlikely first novelists, has produced one of its most enjoyable, offbeat thrillers. Ide (pronounced E-day), who is 58, is a bit late to take up the fiction game. He has said that he finds inspiration in his colorful past: He’s Japanese American and grew up in an African American section of South Central Los Angeles. In a biographical sketch included with “IQ” he recalls the neighborhood in terms of run-down houses, pool halls, bars, drug deals, hookers, crime and rampant gangs. He didn’t like school but made it through college. He tried teaching high school but found his students obnoxious, whereupon he bounced from job to job until he took up screenwriting, without success. Finally he set out to write a novel about a youngster he says is much like his early self and — Bingo! — here’s this sometimes scary, often whimsical, off-the-wall delight. Los Angeles Review of Books: When we think about mystery novels, we tend to draw a distinction between the more classically Sherlockian heroes (the intellectual, the analyst, idiosyncratic and deductive, solving cases like crossword puzzles, clue by clue) and the Dirty Harry types, physically impressive and more inclined to smash through to their solutions with brawling and gunplay. The truth is, these two strands have been interwoven since the beginning; there’s a turning point in The Maltese Falcon where Sam Spade divines obscure intelligence from a newspaper page, and another one where he punches a policeman in the face. 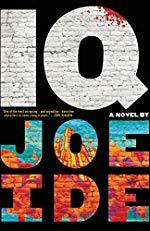 IQ, the debut novel from Los Angeles native Joe Ide — who is new to fiction after a career in film — features a protagonist who will please fans of both traditions, as well as those crime fiction readers who like it both ways. There are spots within the novel where Isaiah Quintabe makes dazzling leaps of reasoning, and there is a spot where he literally fires a grenade launcher. At the heart of the book, though, is the emotional, intellectual, and spiritual growth of its hero, a boy who grows quickly into a man (and a private investigator) after the death of his brother. I loved the comic sequences and the sensibility of IQ, but what stuck with me most of all was that sadness and sense of seeking. The Guardian: With top-rating TV modernisations – the BBC’s Sherlock and CBS’s Elementary – on each side of the Atlantic, American writer Joe Ide now begins a series of novels relocating the brain of Baker Street to South Central Los Angeles. Holmes finds his latest incarnation in Isaiah Quintabe, a 26-year-old African American, whose brilliant mind justifies his initial-nickname of IQ. In Hurston, a rough area where the finest diner is the Big Meaty Burger, he sets up as a private eye, taking on “local cases where the police could not or would not get involved”. IQ has known, as his London predecessor did, the temptation of recreational drugs, and his understanding of the criminal mentality is based on experience. His involvement in crime was typically idiosyncratic, stealing items (hair extensions, luxury pet products such as “feline epilepsy strips”) with low security but high resale value. In common with all renovated Holmeses, Isaiah is notable for noticing, although, when complimented on his deductive skills, characteristically corrects the compliment, pointing out that the process he employs is, in fact, “induction”, in which a broader truth is drawn from a particular detail, rather than “deduction”, which does the opposite. If you enjoy this, check out the sequel Righteous. The setting changes, which is at first jarring given how important it is to the feel of IQ, but the main characters are still so very good. I thought Righteous was superior and I'll probably post about that one too if there's enough interest in discussing IQ. I am near finishing Righteous, but I'll try to remember IQ enough to discuss it here. I thought that IQ himself was an excellent character, but honestly, if it weren't for Ide himself talking so much about how Holmesian he wants IQ to be, I never would have made the connection. Sure, he's a sort of consulting detective who draws a lot from small clues, but he just doesn't feel Holmesesque. There's only so many things you can "update" about an archetype before it ceases to be that archetype. Plotwise, when the Superdog became the focus of things, I rolled my eyes, but it got better, and I eventually felt like, okay, maybe this could work, and this is how a regular person would track it backward. Characterwise, I liked how... messy? everyone was, and how human. Everyone had their own lives and issues -- they weren't just "IQ's sidekick" or "that guy IQ has to get information from". Some of them were a touch too precise in their roles, but those things are tropes for a reason. Overall, it was an excellent debut novel, and a terrific introduction of a character I want to see more from, in a setting that I want to learn more about. It's funny, Sherlock Holmes was what I thought of immediately even before reading any of the reviews. The dog thing seemed a bit of a slight homage to Hound of the Baskervilles, or at least that's what I thought of. I thought Ide did a great job with the characters, making them colorful and just complex enough to really enjoy them. Oh hey, I finished Righteous and I liked it more than IQ, esp. once I figured out that it had two slightly different timelines. I liked this and its sequel. Ide uses the elements of the genre without it feeling derivative, and the books are fun to read, with engaging characters. I'll definitely read future books by this author. Thanks for posting this - chiming in late because I just finished the book after picking it up because of this post. I am a sucker for a Sherlockian detective, and I thought this was a good spin on the trope. I have the sequel on hold at the library now. I actually liked the backstory better than the main mystery plot, but I thought the whole thing was entertaining. I especially enjoyed the IQ - Dodson version of the Sherlock-Watson relationship; Dodson is more adversarial than the traditional Watson type, and also more inventive. Also, I find Sherlock homages often lean harder on the addict angle than I enjoy, so I appreciated that Ide avoided that.